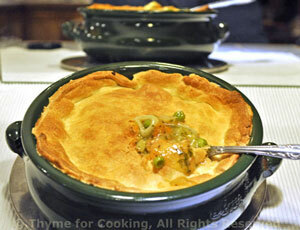 Chicken Pot Pie, Thyme for Cooking easy one dish dinner. This is modified, slightly, using only a top crust, and made simple, using purchased puff pastry, Make it in 2 single serving dishes or 1 larger. You can stretch or roll puff pastry a bit to fit, if needed. Peel carrots and slice into thin half circles. Trim and thinly slice leeks and celery. Cut chicken into 1" (2.5cm) pieces. Heat oil in medium skillet over medium-high heat. Add stock, wine, herbs and bring to a boil. Add peas and simmer 5 minutes longer. Add cornstarch mixture and stir until thickened. Divide stew and place into 2 individual baking dishes or put all in 1 larger dish (8" or 9" square, 20cm). Cut puff pastry to fit and place on top. It should be just slightly larger than the interior of the dish. Bake, 400F (200C) for 20 minutes. Remove and serve from baking dish(es).